Michael Fournier is a professor at Tufts University but we’ll try not to hold that against him for the moment. He does, after all, teach a class about the history of punk rock and his favorite band is The Minutemen. And this book is about his favorite album, the dense 44 song masterpiece by those San Pedro post-punkers that this book is named after. I’ve been a huge fan of this album for fifteen years and would probably have charted it as my favorite album of all time at various points in my life. As such, I am always a little skeptical that a book can do justice to such a great piece of art. I have devoured every bit of documentation and analysis about this band as they hold such a special place in my life and in my heart. My friend Jim didn’t want to tell me about this book because he was afraid that Fournier would get some things wrong and he would have to hear about it. And hey, the whole book probably clocks in with a comparable word count to the chapter devoted to the band in Michael Azzerad’s masterpiece Our Band Could Be Your Life. What’s really left to say anyway? While the book drags at times because it chose the format of talking about each song individually in order, it didn’t have any great factual errors and managed to pull out some original sources and new spins on old stories. Part of the charm of Mike Watt is that he always tells the same story a little differently and his use of slang and liberal innovation with language can often leave a white collar interviewer scratching their head or employing frequent [use of] clarifying marks. The first notable thing I learned was that the title has even more meanings than previously explained. For the newbie, Double Nickels is a reference to Sammy Hagar’s I Can’t Drive 55. The Minutemen don’t think that speeding in your fast car is really an admirable kind of rock-n-roll rebellion so the joke was that they would drive 55 mph (double nickels) on the dime. I had always understood this to mean exactly 55 but apparently interstate ten that runs through Pedro is also nicknamed “the dime”. Punk’s pioneers were clever in so many ways there are probably innumerable other meanings that will be lost to history. What’s important is that they achieved their vision, changed the face of punk rock forever, and maintained their humble, approachable, working class selves before and after. And we can’t avoid talking about the real triumph of the actual album without mentioning that the greatest album by this extremely influential band was practically an accident. Their contemporaries and friends Husker Du decided in 1984 that they were going to produce a double LP concept album and gave wind of these plans to the Minutemen who simply had never thought of the idea to make a DOUBLE album before and accepted a noncompetitive challenge. So they set to write and record enough songs to fill four sides of a record. Mind you, with most songs clocking in around a minute and a half, this was an even bigger task than it was for the Huskers. Maybe it was the pressure that made this album so great or the inside jokes that kept the band so interested or the fact that each band member got to sequence one side on an LP, giving a lot of individual personality to the record. I had never noticed something that’s touched on repeatedly in this book: that the songs picked by each band member for their respective sides were often written by someone else, often times with lyrics penned by friends of the band. The Minutemen were very afraid of and conscious of their potential to go stagnant in the process of recording literally hundreds of songs so they would bring in their friends and neighbors, proving that they were certainly representing the people. George seems to craft a lot of the lyrics and D. Boon sings them with such conviction that you know they are speaking to you. Much ink is spent illustrating how many of the inside jokes, complexities, and intentional contradictions that the band snuck into the album were wholly doomed to be lost on all but the most astute and dedicated repeat listener, or someone from their social circle; The emotional song with a mechanical beat, the Ummugumma solo song concept, the local guitar player who lived in his car that had a song written in his style, the titles that provided further commentary but never appeared as lyrics in the songs, the fact that George Hurley often forgot the meanings of his lyrics minutes after writing them, the bass and guitar almost never playing related parts, the self-deprication, the constant contest for which instrument was “leading” each song or could out the most in a band full of lead players, and History Lessons, Part Two, the beautiful song comprised of almost entirely shout outs to their inspirations. I would have liked to have more time and thought spent analyzing the lasting influence of The Minutemen, who have arguably achieved more success twenty years after they broke up than in their heavy touring days. It’s a great story to hear Mike Watt explain that he licensed “Corona” to the television show Jackass so people could learn and appreciate his best friend’s music but the real gems in the book are slim. Lance Hahn has a full page quote talking about how ethically inspirational and relevant The Minutemen were to him as a musician and artist but those parts tend to end abruptly and not fully develop. Mike Watt asking questions about where the Contras bought their guns provides new depth to his character that is arguably more interesting than a song-by-song analysis of which ones were jazz, funk, flamenco, or blues-influenced numbers. The book suffers too much from anecdotes, asides, and tangents. Much of the story is steeped in understanding the author’s personal history with the record, which works well in the beginning but the constant return to it gets a little tedious at times. But I stand corrected and there is no shortage of things to write about the brilliance of The Minutemen. The sheer amount that I am compelled to type about this book proves that it’s interesting and worth a couple hours of your eyes and brain. There would be no value in agreeing with everything that you read wholeheartedly. You can get a copy of Double Nickels on the Dime at Amazon. If there were 36 hours in a day, Joe Biel would make a zine simply about The Minutemen. He works here, here, and here when he’s not on tour with some project or another. 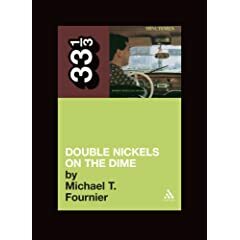 No user commented in " Book Review: Double Nickels on the Dime by Michael T. Fournier "